Melissa Biscardi has been writing health related articles since 2007. Her articles have appeared in such publications as "Alzheimer's Care Today" and "Topics in Geriatric Rehabilitation." Biscardi has a Bachelor of Science in nursing from Ryerson University in Toronto. She also completed a pre-doctoral internship focusing of prevention of neurotrauma in newborns at the Institute of Child Study. The world has a vast array of rice varieties. Rice varies in texture, size, shape, aroma and stickiness. Rice is also available in a number of colors, including white, brown, red and deep purple. Deep purple rice gets its dark color from its outer coating of black bran. When purple rice is cooked, the bran gives it a nutty flavor and adds to its dietary fiber. 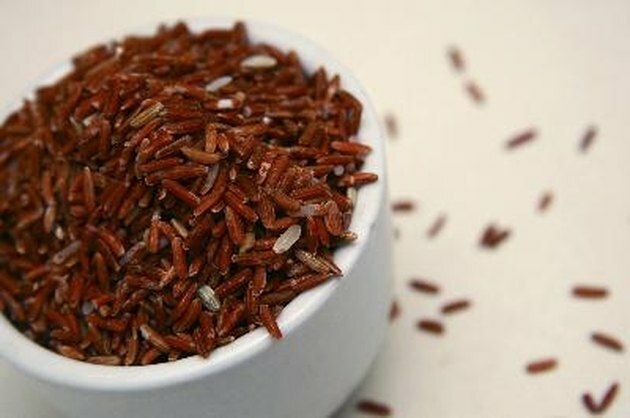 Purple rice can be found in many health food stores and organic food stores. As rice has evolved over the years, it has absorbed nutrients from local soils. Therefore, different types of rice will have different nutritional properties. Each variety of rice brings its own unique nutritional benefits to your diet. Purple jasmine rice contains 100 calories per 1/2-cup cooked serving, while purple sticky rice contains 160 calories per the same serving. Rice is a low-fat food. Purple jasmine rice contains no fat, and purple sticky rice contains 1.5 g of unsaturated fat per serving. According to the U.S. Dietary Guidelines from the Department of Health and Human Services, fat should account for 25 to 35 percent of your daily calories. Of these, less than 10 percent should be from saturated fats. Rice is rich in carbohydrates and has a small amount of protein. The daily recommended carbohydrate intake is 130 g per day, while the recommended protein intake is 46 g for women and 56 g for men. One serving of purple jasmine rice has 22 g of carbohydrates and 2 g of protein, while one serving of purple sticky rice has 34 g of carbohydrates and 5 g of protein. Purple rice has a moderate amount of B vitamins and dietary fiber. Eating foods that are high in fiber will help you stay fuller longer after you eat. This may be useful if you are trying to lose weight. Although purple jasmine rice has no dietary fiber, purple sticky rice has 2 g of dietary fiber. The daily recommended fiber intake is 28 g for women and 34 g for men. If you are increasing your fiber intake, do so gradually to avoid gas and stomach cramps.